The Windows version requires the NVIDIA PhysX Legacy System Software to prevent a crash at launch. 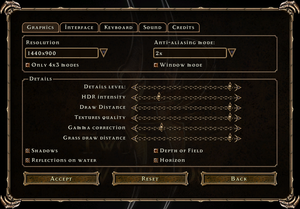 Two Worlds Control Panel allows advanced tweaking and can fix some errors. The Epic Edition is a complete edition with both DLC add-ons (Tainted Blood and Curse of Souls). Versions other than GOG.com and Steam use Reality Pump DRM. The latest retail patch is Patch 1.7b, which fixes various issues and adds new co-op quests. Digital distribution versions already include this patch. Two Worlds Control Panel can be used to make various tweaks and improvements, including enabling high-detail shadows and XInput controller support (see Controller support). It can also install/uninstall mods using its integrated mod manager. Install and run Two Worlds Control Panel. Go to Tweaks, then click Disable Intros. Change ShowIntro from 1 to 0. 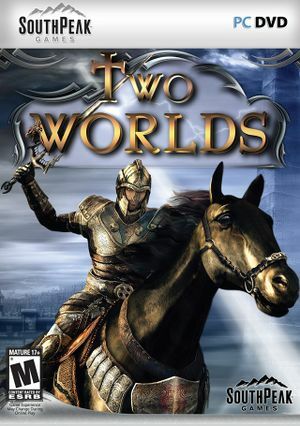 When Two Worlds is installed on Windows Vista and later a registry setting is set that prevents it from showing the window for separate character profiles. Fixing this setting re-enables this window, allowing you to keep saves for multiple characters conveniently separated. Move your existing saves (if any) to the new location; see save game data location. Note: <path-to-game>\Parameters\AutoexecGame.con should be created manually. It supports various tweaks, such as engine settings and etc. High Draw Distance settings will cause some visible terrain gaps. None, 1x, 2x, 4x or 8x. Toggle Hardware Cursor in Settings, Interface. XInput controllers only; see Controller support. Install and run the Two Worlds Control Panel, then go to Tweaks and choose Enable Xbox Gamepad. Go to HKEY_CURRENT_USER\Software\Reality Pump\TwoWorlds\Interface, then change EnablePad from 0 to 1. You can still choose the mouse option and/or play without an Xbox 360 Controller present with this feature enabled so there is no need to disable it afterwards. 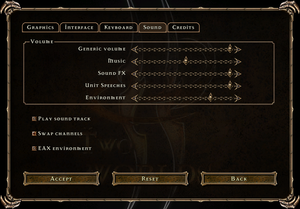 Generic (master), Music, Sound FX, Unit Speeches and Environment. Online features require registering an account in-game with the product key; for the GOG.com version the key is available by submitting a multiplayer key request. The Ageia PhysX bundled with the game refuses to install if a newer PhysX version is present. Install Two Worlds without Ageia PhysX (if you haven't already); cancel and close Ageia PhysX when it appears. Download and install the DirectX End-User Runtimes. Uninstall or disable any codec packs installed on your PC. This problem may be cause by the K-Lite Codec Pack. Rename RunGame to RunGame.backup and paste downloaded file here. Run Game, it should now use wine provided by your distro. Fix works best on a new installation of the game.